How to Crack Windows 7 Password by yourself if suddenly forgot the password? Cracking Windows 7 Password may sound dangerous and illegal. Legally cracking or unlocking your own Windows password is certainly a legitimate practice! It is the best way when the day comes that you forgot Windows 7 password. But how can you crack Windows 7 password? This article will show you how to accomplish resetting Windows 7 password in detail. Don’t laugh! Actually sometimes, it is an efficient way. So be confident in the reliability of your memory. Think over all things that relate with your Window 7 password. For instant, birthday, phone number, favorite fruit, your child’s nick name and the like. If you are lucky enough, you will probably remember the password. If you have just given up your bad memory, just proceed to the next way. In the market, there are many programs that can help you reset Windows 7 password. However, I highly recommend one named Windows 7 Password Cracker. 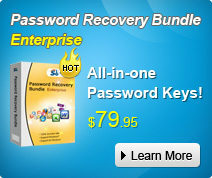 It is by far the best one to reset, recover Windows 7 Password with 100% safety guarantee. Here I provide a step-by-step direction, hope it can help you especially those novice of computer users. We divide the direction into two parts, because we need accomplish the whole procedure on two computers, one is accessible to Windows system, and the other is the one we need to crack the password for. a. Insert a blank CD into accessible computer’s drive. Launch Windows Password Recovery after you download and setup it. b. Choose “reset Windows local account password”. And specify the target device. c. Click “burn” to start the password reset CD creation. It will take a few minutes. a. Insert this CD on the second computer, and start it with this CD. b. You will enter the main interface of Windows 7 Password Recovery. Specify the Windows installation, and highlight the user account you want to reset password. c. Click “reset” and then click “Yes” in the next popup. Your Windows 7 password has been removed. d. Click “reboot” to restart your computer. Try this Windows 7 Password Cracker! It is very easy for you to get into your Windows 7 if your memory keeps on failing you.